Just like that you engrossed the media for days or weeks, nationally or internationally. It wasn’t easy, but you did it by demonstrating the most impressive media relations strategy we saw this year. Your cause advocacy campaign kept our judges at the edge of their seats. Your striking video response to breaking news immediately calmed a public relations crisis or expanded your brand recognition hugely. The point is, the work you submitted in PR Daily’s 2016 Media Relations Awards was stuff to brag about. We wanted to see the plans, the pitch and the earned media coverage, and boy, you delivered. Thank you to everyone who entered this year. You work kept us on our toes, and we’re already looking forward to next year. 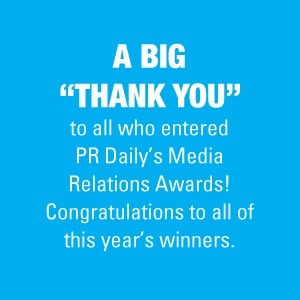 Please join us in congratulating the winners of PR Daily’s 2016 Media Relations Awards! Westgate Resorts Veterans Day Vacation Giveaway, TJM Communications, Inc.
Love Your Lawyer Day, Nader Anise Lawyer Marketing, Inc.